Oh Wittgenstein. You know just how to put things. He means essentially that if our language – or our personal level of literacy – doesn’t have the words to describe a concept, we will not have any way to communicate that concept, or even think it. If you don’t know the word ‘kairos’, you’re missing out. The ancient Greeks had two words for time, and kairos was the second. The first was chronos, which we still use in words like chronological and anachronism. It refers to clock time – time that can be measured – seconds, minutes, hours, years. The Greeks liked to personify just about everything, and you’re probably familiar with the personification of Chronos: just think of old Father Time. A weary, bent-backed old man with a long grey beard, carrying a scythe and an hourglass. His resemblance to the Grim Reaper is not accidental. Chronos, or Saturn to the Romans, is the stuff that kills you. It takes away everything you have and then it eats you too. 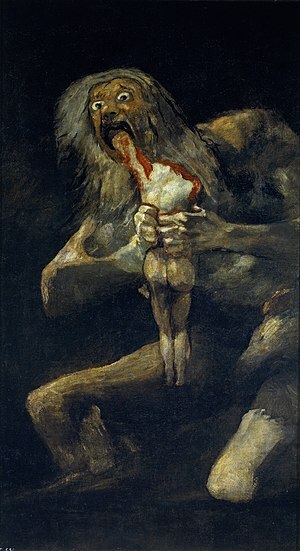 Take a look at Francisco de Goya’s ‘Saturn Devouring His Son’, to the right. That’s Chronos in all his gruesome depravity. Ancient Indians had the same divided notions of time: chronological and kairotic. And like the Greeks, they mistrusted Chronos. The Sanskrit equivalent of chronos is kala, from which the destructive goddess Kali takes her name. The image of her dancing on corpses with a belt of skulls and severed hands is grisly enough to put one in mind of, well, Goya. The Sanskrit word for qualitative time is ritu. Like kairos, it has a spiritual sense to it, time that is lifted out of the ordinary business of life. It also connotes the ‘right’ time, and is still used in Hinduism to refer to the correct moment for various ceremonies and rituals. A time to be born, and a time to die; a time to plant, and a time to pluck up that which is planted…” and so on. In the first Greek translations of the Bible, each use of the word ‘time’ in the above passage is rendered as kairos, not chronos. In 1985, a group of black South African theologians wrote a response to recent crackdowns by the Apartheid government. It was called The Kairos Document, and it began “The time has come. The moment of truth has arrived.” The Document was pervaded with a strong sense that the time was ripe for change: the fate of South Africa balanced on a knife’s edge, and small actions might have the power to change the path of history. But kairos need not be as dramatic as that. It can be a small moment in one person’s life that is ripe, and full, and perfect. Perfect. We are told, in general, not to expect perfection. If someone promises it they’re either selling something or deluding themselves. We conflate idealism with naïveté and pessimism with ‘just being realistic’. But to deny the existence of perfection is to deny the evidence of our own lives. In Chuck Palahnuik’s Fight Club, Tyler Durden spends hours dragging driftwood logs into position on a lonely beach. And the most you can expect from a moment is that it be perfect. It’s hard to pin down an example, but I’ll try: Some years ago I was wandering through Sydney’s Hyde Park. The Night Noodle Markets were on, and workers streamed out of their offices and into the approaching dusk. Red lanterns were strung between the trees and the stalls. The sharp sweet scent of a hundred different kinds of noodles filled the air. Music drifted in from a distant stage. Somewhere in the crowd, a beloved friend was waiting. And there was a perfect stillness and serenity within me, and a sense of enormous significance. Part of me didn’t dare move, for fear of bursting the soap bubble of the moment. At the same time I knew that no step I took could be a wrong one, just then. If this sounds a little mystical, I’m sorry. I’m not sure you really can describe a moment of kairos, but maybe you can help someone recognise a time in their own life when they’ve felt it. The trend in Western society is towards standardising experience. Chain restaurants have extended their reach beyond a quick burger to high-end places like Jamie Oliver’s branded restaurants. Each Squid Ink Risotto served is as predictably like another as one tick of a clock is to the next. Travel companies now oxymoronically provide package tours for the independent, grassroots traveller. Be inspired and awed at precisely-timed intervals. Pop music has been manufactured to a formula for decades, not to mention the avalanche of clones that pours out every time a new book becomes a bestseller. You could fill a library with artless copies of Twilight and The Da Vinci Code. All of this is designed to ensure nothing too strange or disappointing ever happens to us. The only way to keep safe from disappointment is to avoid any risk of surprise altogether. How, in all this homogenising, can we hope to encounter kairos? It’s not as grim a prospect as I just painted. Sometimes, when you go to see live music – maybe someone famous, but it could easily just be a guy with a guitar your friend dragged you along to – and as the first notes start up, a swelling of anticipation rises in you. You realise this will be something special. Maybe his guitar-playing is nothing spectacular, but his voice his arrestingly beautiful. Or his voice is rough, but his lyrics seem true and important to you. Whatever it is, you stop noticing the passage of time. You forget you were ever annoyed with your friend, that you were tired, and the hundred other things you’d been worrying about. It might not be music. You might be walking along a beach, or drinking wine in a park, and you’ll realise there isn’t one thing you would change about the moment. There is a sense of abundance, that the universe is full of good things, there for the plucking. But you have to risk disappointment to find these moments. It’s how a traveller can miss their flight, get food poisoning, lose their passport and still talk about the trip with shining eyes and flushed cheeks. They’re remembering kairos. The catch though, is that kairos can’t be planned, and it certainly can’t be forced. The best you can do is pay attention to the sort of things that lure it your way – if not much seems to, then try a hundred new things – and throw yourself across its path. Run the risk of being bored, tired and footsore. The most you can expect from perfection is that it last just one moment. And the most you can expect from a moment is that it be perfect. If you enjoyed this, maybe you’d like my fortnightly newsletter, The Whippet! Each issue has a piece of my own writing plus 3-5 curated articles that I think curious, thoughtful people will be interested in. Subscribe here! Well done, this is brilliant. I hope to someday write as well as you. Oh gosh! That’s very touching, thank you. I believe you have described a moment of grace; grace as a state of sensing or feeling perfection in God’s creations. Reading that sentence gave me back quite a few perfect moments . I totally get that! Thanks. MIT press has a new series, documents of art. TIME includes an essay by Paul Chan, A Time Apart. Just what we’re talking about. A friend of mine recently touched on the subject and shared the understanding and in that very moment, the ‘Kairos’ moments of my life flashed by in my mind. It felt as though it was just right, and they were definitely the simplest of moments but the purest! Thanks for this informative work. I’m in the middle of preparing a Sermon. This was just beautiful. Very informative and just excellently posited. I taught the youth in the church i attends about d Greek timing i.e Chronos & Kairos…. I stated clearly d differences and examples of d two terms.. It was helpful and impartful… May God bless u so much 4bringing Chronos n kairos to my understaning. Please keep me inform for more post or topic. Thanks. but his voice his arrestingly beautiful – shall the second “his” not loose the “h”? Stunning blog post and thank you. I work (I call it play) with my clients on the concept of time as Chronos and Kairos and now I’ve found in your post a divine description to refer them to for further contemplation and discernment. THANK YOU! I often encounter the greek concepts of chronos and kairos and reflect on these windows into our existence. As they are greek words they come directly from a ” Western Culture” foundation and are imbedded in our common perception of existence. In addition, as you referred to, they are also used by the Judeo/ Christian traditions frequently and as such they are even more an essentially “western” conception of reality. I think its helpful, and even crucial to draw a distinction between the use of the term “Western Society” and what is passing as “Western” today. As we seek to cleanse our selves of the irritating distractions that seem to swallow us up like Saturn these days, we want to be careful not to “throw the baby out with the bath water”. When one opens up our experiences of chronos and kairos as you have in your blog it alerts us to the essential and rich traditions and concepts of what “Western Society” is actually made of, and not just the glitz of what I refer to as the “technnofrenic” chronos in which we live today. I can’t fully express how grateful I was to read this today. I have been blindly searching for the word to describe this very concept in my own life for many years now. I had all but given up hope that my strange and ephemeral experiences were shared by other people. And now I have evidence of the contrary, and I’m so pleased! Thank you for encapsulating this idea into such beautiful prose. I am bookmarking this page simply to keep the thoughts enlivened in my mind today. I believe, truly, that I experience a “kairos moment” while reading your words. That was a beautifully written piece!! Mother and I were looking up the definition of Chronos and Kairos, and yours is the best! Reading the article left me feeling abundantly devine.. Thank you for putting it together.. Your stories makes it easier to understand the difference between chronos and kairos. Thanks for helping me write a blog post and prepare to teach an honors class. Thanks for writing this article. I was searching for a way to describing time for my sculpture project in my art degree, and it’s really helpful by pinning down just the different ways of describing time. Hi there,I read your blogs named “Create a website or blog at WordPress.com” on a regular basis.Your story-telling style is awesome, keep up the good work! And you can look our website about proxy server list. As every moment is perfect, it is perfect in this moment that I came across this blog. Your writing is amazing. I am a great believer in serendipity. I stumbled across your post through another link.A happy accident that will make me a frequent visitor to your site. Graceful Writing. I choose Kairos. From the comments made it is like the two concepts of time are related. Kairos is chronos. Opportunities and memorable moments are within the chronological and sequential time. What do you think friends? As I look back… you know that 20/20 vision you have after the fact…I realise I had a kairos moment that lasted more than a moment. I made some very stupid decisions and hooked up with a man that I was not supposed to be with. My situation went from bad to worse and I was in constant fear, doubt, worry, depression, anger, hate etc. I felt I was drowning with no help in sight. One day I realised that my boring, uneventful, insignificant life pre relationship was my kairos (didn’t use that term as I am just learning it now). I had love and peace and contentment. And I gave that all up for the before mentioned disaster. Oh what I wouldn’t give to go back to my ‘boring’ life! As my story proceeds, I have finally made it out of that relationship. PTL. I had my kairos and didn’t know it til it was gone 😥 Praying to be more aware of the good moments and less aware of the bad. This was beautiful and brilliant. Thank you. I am a worship arts director, and our art gallery is The Kairos Gallery with these ideas quite in mind. But you have described our intentions even better than we have! This article is perfect in a sense of enlightenment. I do understand the passage of time But not so direct in such forum of a ‘God’ theory. In this alone makes your post most worth while in thinking of terms and greater terms of reality. (The Gods are a reflection(s) of are being and THIS (article) professes such ‘new’ outcomes are possible within are nature and to some of us due are thinking and seeking. I think IF this God was in human form, He would BE that wanderer seeking that something and something a passage of life. much respect for those of wanderlust. as a token I give you what you are seeking but what you seek are just not mearly words but understanding. https://en.wikipedia.org/wiki/Not_All_Who_Wander_Are_Lost *again* thank you for putting this in WORDS and not feelings alone. if you read web link, you and ‘they’ will realize we are not alone on these thoughts. This is, in short, brilliant. It is the perfect compliment to my Sunday School lesson where we are studying Abraham and Sarah. This beloved couple LIVED kairos while the rest of the world lived by the biological “clock”. Thanks be to God. BTW, just subscribed! Hungry for more.